then i remove the 15ohm resistor and add a rectifier, reservoir cap, and a load..
- is there a common standard pinout for such connector? - should it be RX/TX/GND or also 5V? what is with theese minatur dc/dc boards youget theese days in all szises? I got a few really small ones for a 606 modding project where the sumida coil got removed to do duty in a xox box. I also found a lot of bleading of the oscilators into the filter of the original 303. i would think that comes thru the refference voltage supply..
AGAIN: there is no "weakness" in the supply. Everything that is there is in the schematic! The DC/DC does not have any (HF) bleed. In fact, it is so clean that the 606 can use it w/o R172*C69 filtering, directly as 15V supply for the analogue part. What *does* happen is, that the current through R172 causes a little to much voltage dropout, so the AN1358 looses regulation. If this happens at all and how large the effect is, depends on the actual value of the 15V supply, mainly determined by D42 and its tolerance. This has a relative large influence on the maximum setting of the accent. And of course, of the "lost regulation" behavior. And again: dropout voltage of the AN1358 is 2.5V. Current consumption is around 20mA. The H11L1 is pretty expensive (and *a lot* faster than needed), the PC900 is obsolete. The 6N138 is currently the usual selection for MIDI. The 74HC4050 is not that much needed (.. I'd select a 74HC14, of course two gates needed per buffer, as it is inverting ... and no, there is no real reason for that... ) except for the midi through buffer. The ATMEL could drive 20mA, the 74HCxx does 6mA. both enough for the 5mA MIDI uses up. Usually only two of the signals are used (at least my software does so), so one might think of a splitter cable. A "compatible" solution would be to have two of the signals as pads on the PCB, some jumpers to select where the signals go, and the builder might drill another hole in the case and wire the jack to that pads. 47µF in the 303, so 100Ohm *47µF=4,7ms. In the x0x it is 100Ohm*100µF=10ms. Which does not do any audible difference until you reach the "lost regulation" mode of operation. i'll change to 6N138 then..
another thing i've been thinking about..
what about those switching supplies on ebay? Nordcore wrote: AGAIN: there is no "weakness" in the supply. 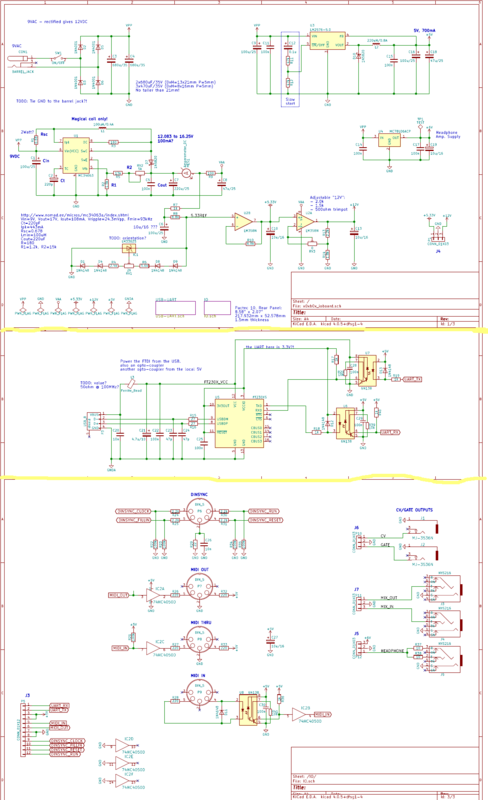 Everything that is there is in the schematic! and how does that differ to the false old school statements and advices for a power supply mod of the xox box? havent that been proved to not cure the stiffness again and again? Do you ever heard a real 303 or tried a xox with 303 supply? When it would be that simple, why is it still an issue? And are you 100% sure that there cant be any detail that has escaped your analyses? Nothing again your expertise, but in the pro audio teams i ve worked we had some problems where some of the best audio circuit developers of my country was consulted, actually guys with an international known and respected name, that have their own companies with a handfull of employes and big rhode and schwarz analyzers.. real lab guys.. With similar projects where ancient 1950 cult audio technology was ment to be cloned.. and again and again this guys was prooven wrong by the ingenuity of the 1950´s developers, that used some tricks that never made it in any school book. they also claimed one resistor would be enough to do this and that,.. but.. nope..it wasnt....once we proved the situation to them they just needed 30 seconds to explain what was going on..they actually had the knowledge allready,,but they didnt expected anything hidden..and wasnt thinking in that direction.. This dot happens often, just had it 3 times in the last 20 years that electronic specialists can be wrong when it comes to sound influences of circuit design. But thats enough to question over simplified solutions a little. When the best guys in the industry can go in the trap of taking the own cemented knowledge as granted when it comes to sound phenomenas, it can happen to any circuit developer. which resistor? r172? its years ago...but thats the one i tried, that dont works..just weakens the peaks..but dont adds elasticity.. When that failed i rebuilded the original 303 circuit..that gave a huge sound improvement.. more in the direction to get to the singing quality on accented high resonance lines..and more elastic, havent i posted a sound example here? anyway.. you might have noted that there are 2 clone versions out there that use a sumida coil.. in your world just for superstitious reasons. But aslong you dont allow yourself to look at the problem from another angel its not likely that you will find the reason why that coil has a usefull impact on the sound.. no hf bleed? ok.. than what? 20 mA..constant? or with too fast fluctuations to be seen on simple meters? You hear fluctuations on the real 303--ts allmost like a pumping compressor.. with batteries that get empty the machine actually sounds the best.. In the early 90´s we allways had a batch half empty batteries in the studio to have them at hand for the final mix run downs.. So reduced voltage before the coild does something good.. increases the breathing fx.. also modulates the tuning a little, buts not just the tuning.. anyway, i gues you guys are the wrong adress for the issue anyway. But maybe its good for future investigators into the topics to read that remarks out of the world of practical 303 application. 3phase, are you even reading the conversation? Nordcore already explained how the x0x supply works, and what the main difference is with the original one, read the first page! do you have anything to say about them? i just use similar ones now on a modded 606 to run the sound stages on a higher voltage.. there are really small versions, but i havent found them on ebay yet..just posted an example picture.. maybe they also could be beneficial for alternative xox supplies.. no idea if they share sound modulating characteristics with the sumida coil design.. they are closer related than a standard voltage regulator. and you get step down and step up versions for whatever task at hand.. and best of all..as smaller as cheaper they get.. the boards i got just 2 euros each..
and regarding the control voltage on the filter.. i know that such filters are current controled, but the oscilator bleed i see in the voltage shoudl be present in the associated currentflow aswell. Question ..where does that osc beeld comems from? maybe just from inside the filter bleeding thru R69? probably most likely, or? Anyway..dont explains the power supply "myths". antto wrote: 3phase, are you even reading the conversation? sure i do, but why is he referring to r172 than? i already did with pointing you to the ready made boards that safe you from handling a magical coil since its all pre installed already. The FTDI can be used with 3.3V I/O mode (as drawn), but than the 1k resistors are too large. OR you could hook up pin 3 (VCCIO) to pin 12 (VCC from the USB) which would give (about) 5V I/O. Regarding space: may be resistor arrays help a little?